3. URL of spoof website disguised as " Sign on to Online Account "
4. Real URL looks nothing like Regions . 6. Spoof website apparently not online time of report - may have been disabled, but may be reactivated, so be wary!
" 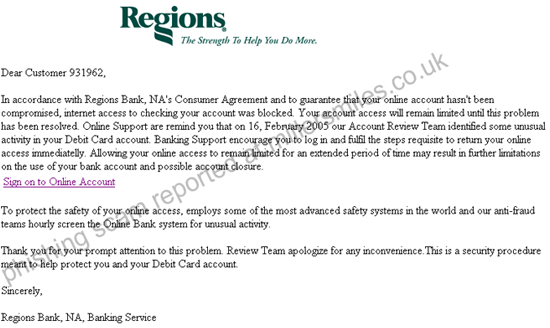 In accordance with Regions Bank, NA's Consumer Agreement and to guarantee that your online account hasn't been compromised, internet access to checking your account was blocked. "